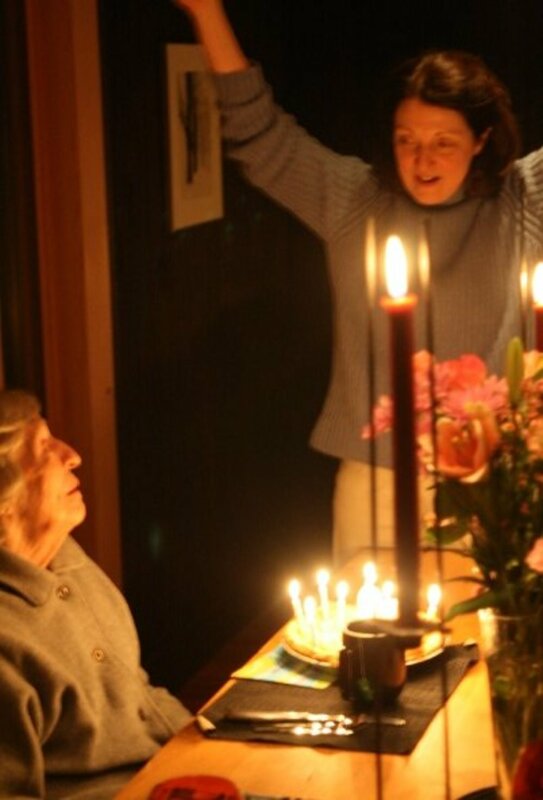 Photo: Mom and me on her 91st birthday, January 2009. In December 2008, my Mom, Pat Rankin, was sitting with Tina (caregiver) in the kitchen while Charlie and I were decorating the tree in the living room. I came in on the tail end of Mom's wonderful conversation about Christmas. What is miraculous about this is that Mom had dementia and really could not put a whole sentence together. This was a gift. I cherished anything of her true self when it shined through. Mom references the journal she kept from the time my older brother was born in 1946 to April 2006 when she could not see well enough to continue writing. We would read it to her and it served as her substitute memory when her own had failed. Here are excerpts of what Tina wrote down from Mom’s Christmas thoughts: "Mother (my Mom’s mother) used to say, all you need on Christmas is love, family, happiness. It was important! I keep thinking how important time is. Christmas is always an important day. It brings to life; love, attention and the good times people used to have. What do I do when I don't have any more gifts to give? Gifts are supposed to be thought about, not big, just something nice for the person to make them have a good time…. I keep thinking about each year to reach happiness. It's nice when you want to let them know they're thought about and important. People should know how kind and loving they are… There is so much importance to each day. I am thinking about each year and how important each member of the family is. That's why I started the journal, not to forget any part of it." Thank you Jonatha for providing this space. I have loved your voice and music for a very long time. Thank you!